On Monday evening, the New York League of Conservation Voters held its spring gala at Chelsea Piers. The organization describes itself as “the only statewide environmental organization in New York that fights for clean water, clean air, renewable energy and open space through political action. We’re non-partisan, pragmatic and effective.” What the League doesn’t brag about is its all-out embrace of shale gas, a fossil fuel which poisons air and water and displaces truly green, renewable energy. The honoree was Mayor Bloomberg, who also thinks shale gas is pretty swell and has arranged for it to be pumped throughout the five boroughs. The corporate frackers and their infrastructure cousins were all too happy to show appreciation and NYLCV provided them with the perfect venue. Among the list were Chesapeake Energy, Spectra, Williams, Con Ed, National Grid and a bevy of others. 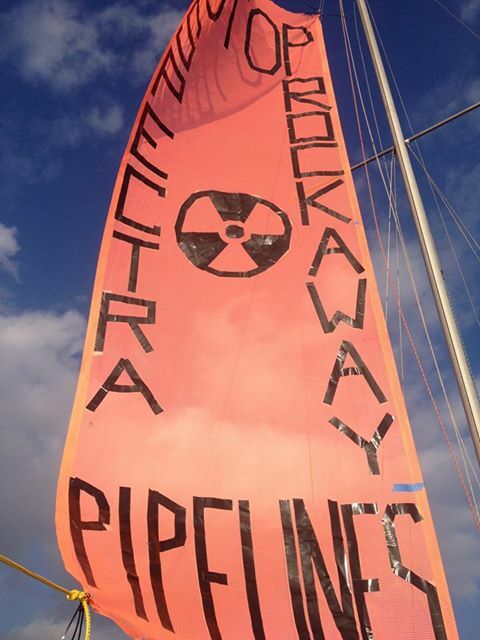 Luckily for the city, intrepid activists who can smell greenwashers a mile away from Sane Energy Project, Occupy the Pipeline, United for Action and other orgs were on the scene, and the Hudson River (photo of sail below). There was even a saxophonist! Media about the action was on the Earth First! newswire. Video footage is posted here and here. 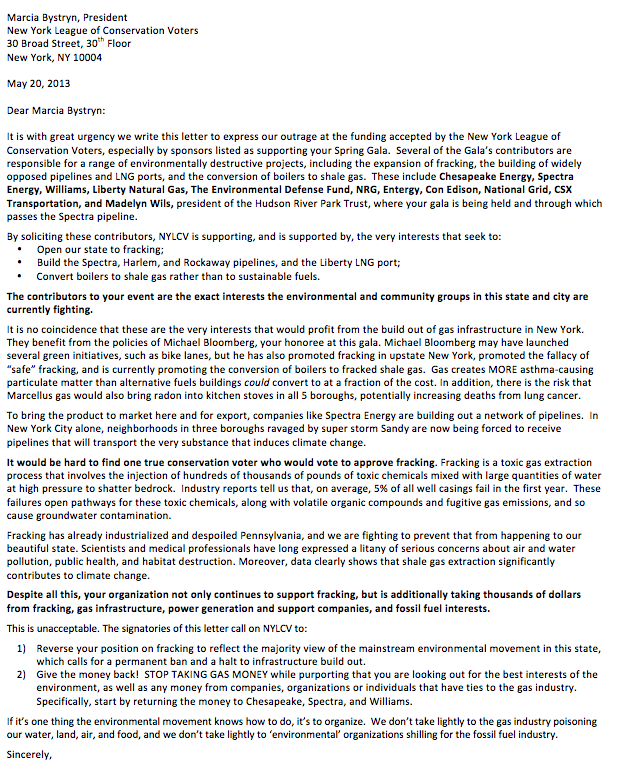 The full letter which the group presented to LCV and gala guests can be read here. As David Braun from United for Action puts it, “We expect greenwashing from corporate polluters trying to improve their image, but it’s another thing when it comes from an organization that defines itself as an environmental advocate.” Let’s pressure these groups to change their stances, like Sierra Club did after it was revealed they took millions from Chesapeake Energy and its disgraced ex-CEO Aubrey McClendon. In Pennsylvania, Colorado, and other states across the country which are currently being “fracked,” the Environmental Defense Fund (the beneficiary of a Michael Bloomberg $6 million gift and a gala “patron”) is also working with the gas industry, helping them promote “best practices” and thereby providing them with green cover.